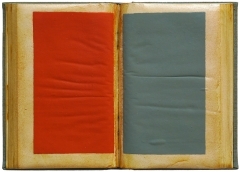 A series of manipulated books. Rice glue, shellac, model enamel. 2013/2016 ongoing. Somehow, a book is always already a locked-down item, its beginnings and endings determined before the arrival of a reader, a bundle of conventions representative of a time since past, a crumbling ruin. Books are dry, limited, burnable. In the real present, things are a lot more fluid and scary. In the Open Books I’ve replaced the illusory temporality provided by the passage from one word to the next with a simple binary fluctuation between more or less equal tonal fields; a more or less continuous present in which the only significant action is a simple yes or no, on or off, believe it or not, this or that. I read the Open Book as a pivot artefact, an interrupted narrative. As I look at it I’m in the middle of an unfolding story, at the bottom of one page and at the top of the next, poised between a past and a future. And the past and the future are sort of unknowable; the past available only through memory and the future only through projection. The comfort provided by narrative convention is missing. This could be a state of bliss or one of pure horror, depending on your sensibilities. The object’s representational potential has been “turned”, from the conventional narrative pathways contained by a book, toward a different kind of signification. The book/object can still be read, but it must be read according to the conventions of visual art, more specifically those surrounding the readymade, the monochrome, the multiple, and strategies of appropriation generally (the titles are somehow appropriations as well, but have to be consumed now in the light of the transformed book’s object status. For example the title of the book, “Black Beauty” now juxtaposed with minimal colour fields, establishes a connection through Anna Sewell’s 1877 novel to Malevich’s 1915 Black Square and the subsequent development of the monochrome). Whilst making the Open Books I’ve mused about the ongoing digitisation of all old and new pieces of writing, and entertained the apocalyptic notion that some kind of electro mechanical disaster could neutralise text based knowledge in a globalised digital version of the destruction of the library of Alexandria. The reasons for making these things are sort of complex. It occurred to me that rather than buying materials I could use stuff laying around, cardboard packaging etc. Then I started thinking about the transformation of trees into paper to transmit the messages against which our identities form, and all the books on private shelves which have never been read, or are read once and hung onto, expressions of their owner’s self image somehow, like fashion accessories or interior decor. So reducing a book to an abstract field seemed like something worth trying. Neutralising it whilst simultaneously reasserting its materiality, going through it page by page “scanning” the words with a glue laden brush rather than following the threads of a narrative arc, replacing the author(ised)ed narrative with my own banal minute to minute attending-to of making and the flow of thought which accompanies it. I was conscious of the relationship between destruction and creation, and that my action might strike book lovers as a kind of crime. But the thought of the many thousands of copies lying around more or less dormant made the transformation of one kind of object of contemplation into another resemble a rescue operation. 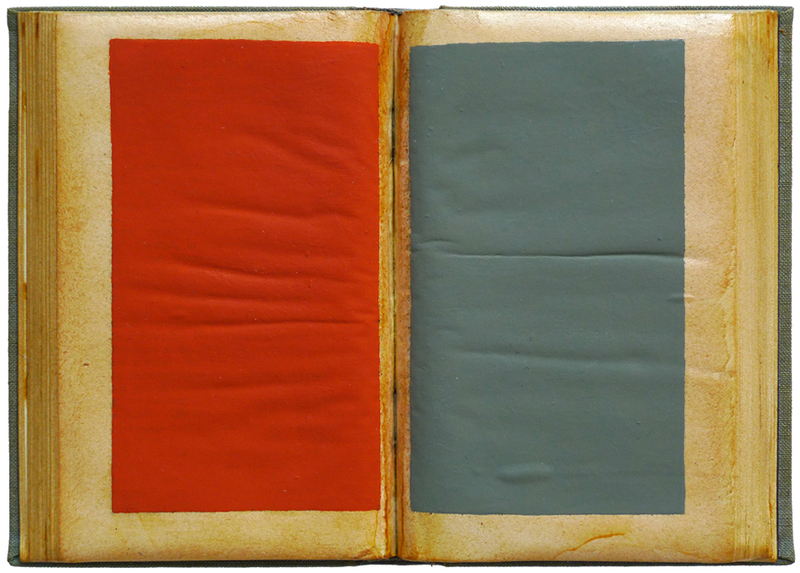 Of course, unlike the conversion of trees into paper, the transformation of these books is only partial, they retain something substantial from their previous state. The destruction which precedes creation in the human realm is never complete; our creation utilises the cobbled together bits of broken things, and the ghosts of broken things inhabit everything we create; an inescapable legacy code which makes perfection an impossible ideal. I confess to a profound longing for a space in which the strident competitive narratives of the contemporary world are reduced to a whisper like the wind in the trees, and I suppose the Open Books are an attempt to generate a kind of stillness in myself, to fleetingly occupy a place similar to the narrow waist of an hour glass where the future collapses into the past one grain at a time.